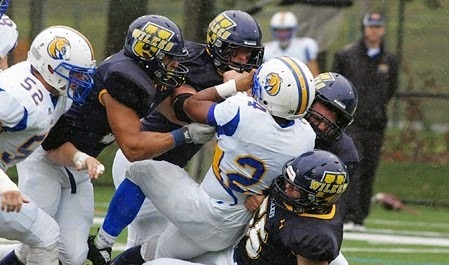 The Wilkes defense was solid all afternoon in the 41-7 victory over Misericordia Saturday. Brown earns first victory as head coach at WilkesEDWARDSVILLE – Sophomore quarterback Ryan Dailey (Easton, PA/Wilson) threw for 212 yards and three touchdowns and the Colonels ran for three more scores on the ground as host Wilkes University posted a 41-7 victory over Misericordia University Saturday afternoon in both teams' Middle Atlantic Conference opener at Schmidt Stadium. Wilkes moves to 1-1 overall and 1-0 in the MAC following the win. Misericordia still seeks its first win of 2014 dropping to 0-2 overall and 0-1 in conference play. With the win, head coach Trey Brown earned his first career victory at Wilkes. After struggling in the season opener against Muhlenberg, the Wilkes offense wasted little time putting its first points on the board this season against the Cougars. On the Colonels first drive, Dailey hit Drew Devitt (Sinking Spring, PA/Wilson) for a 40-yard completion moving Wilkes down to the Misericordia 15. Two plays later, Dailey connected with Tim Bousson (Shamokin, PA/Shamokin) over the middle for a 13-yard touchdown pass to put the Colonels up 7-0 after a Ryan Behrmann (Seven Valleys, PA/Dallastown)extra point. After the Wilkes defense forced a turnover on downs, the offense was back at it again through the air as Dailey found receiver William Deemer (Washington Township, NJ/Warren Hills) for a 67-yard completion moving the Colonels down inside the Cougar ten yard line. PJ Incremona (Wood Ridge, NJ/Wood Ridge) then carried three times from the nine crossing the line for Wilkes' second score from one yard out to up the lead to 13-0. Just as the second quarter opened, Misericordia used a 11-play 46-yard drive to move to the Wilkes 24 before the drive stalled. The Cougars opted for a 41-yard field goal which was blocked by Bousson and picked up and return by Tanner Stengel (Allentown, PA/Parkland) 55 yards to the Misericordia five yard line. From there, the Wilkes offense bullied its way on the ground as Incremona went in for the second time, this time from five yards out to extend the lead to 20-0 with 14:41 left in the first half. After a Misericordia punt, Wilkes began another promising drive highlighted by a Deemer end around run for 26 yards to midfield. Dailey connected with Behrmann for 22 more yards to move the Colonels to the Misericordia 8. From there, Dailey hit his tight end Devitt for a six yard touchdown pass to push the lead to 27-0 following another Behrmann extra point. The Wilkes offense continued to have its way through the air as Dailey recorded his third touchdown pass of the afternoon three minutes before halftime when he found Jeremy Hartman (Little Egg Harbor/Pinelands Regional) streaking down the left side of the field for a 32-yard pitch-and-catch. Wilkes led 34-0 heading into the break. Misericordia got on the board late in the third quarter when quarterback Jeff Puckett ran it in from nine yards out to cut the lead to 34-7, but that was all the offense the Cougars could muster against the stingy Wilkes defense. Wilkes added one more score late in the fourth when Behrmann ran in from three yards out to end the scoring at 41-7. Behrmann and Incremona led the Wilkes ground game with 47 and 42 yards respectively. Incremona accounted for two of the three scores with Behrmann recording the other. As a team Wilkes ran for 133 yards on 38 attempts. Dailey was sound through the air recording a career-high 212 yards and three touchdowns on 8-for-15 passing. He had a group of receivers to throw to with three different Colonels reaching the end zone in the game. Deemer finished with two catches for 85 yards and a score while Hartman (2 receptions/58 yards/1 touchdown) and Devitt (3 receptions/52 yards/1 touchdown) were tough matchups for Misericordia at tight end. Puckett led Misericordia on the ground with a game-high 161 yards on 29 carries. Wilkes takes to the road next Saturday for the first time this season as the Colonels travel to Doylestown, Pa. for a MAC matchup with Delaware Valley at 7:00 p.m.. It marks the first home night game in the Aggies school history.